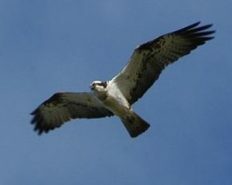 For the last few years, we have been lucky enough to have been visited by a pair of Ospreys, who nest nearby. They return from Africa each Spring to the same tree, and have successfully reared several chicks. In February 2016, thanks to the organisational ability of local resident Rosie Shields, we persuaded Scottish Power to help try to “Osprey-proof” the nearby power lines, and thanks to some wonderful volunteers, installed an artificial platform to help them re-build their nest. At the same time, we installed a CCTV camera, which transmits live footage of the nest to our restaurant. 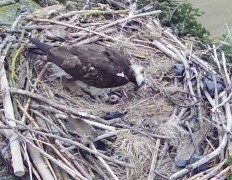 So now we have a ring-side seat as the Ospreys, nicknamed Samson and Freya, hatch and rear their latest brood. The CCTV camera runs from 10am – 5pm, and Rosie is often on-hand to answer any questions. 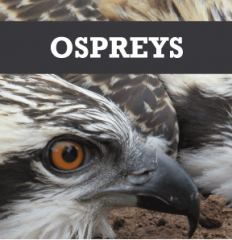 So if you want to discover more about these extraordinary birds, come down and see them for yourself … and follow us on Facebook for all the latest Osprey news! Did you know? Osprey can close their nose when they're diving for fish to stop water getting in!